A powerful and affecting drama of faith, doubt, and redemption as awe woman uncovers the truth about her family, her beliefs, and herself. Estranged for years from her difficult and demanding relatives, Sheila McGann has remained close to her older brother Art, the popular, dynamic pastor of a large suburban parish. When Art finds himself at the center of the maelstrom, Sheila returns to Boston, ready to fight for him and his reputation. What she discovers is more complicated than she imagined. Her strict, lace-curtain-Irish mother is living in a state of angry denial. Sheila's younger brother Mike, to her horror, has already convicted his brother in his heart. But most disturbing of all is Art himself, who persistently dodges Sheila's questions and refuses to defend himself. 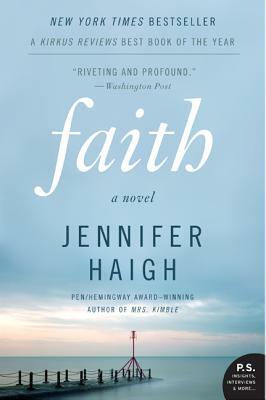 As the scandal forces long-buried secrets to surface, Faith explores the corrosive consequences of one family's history of silence -- and the resilience its members ultimately find in forgiveness. Throughout, Haigh demonstrates how the truth can shatter our deepest beliefs -- and restore them. A gripping, suspenseful tale of one woman's quest for the truth, Faith is a haunting meditation on loyalty and family, doubt and belief. Elegantly crafted, sharply observed, this is Jennifer Haigh's most ambitious novel to date.